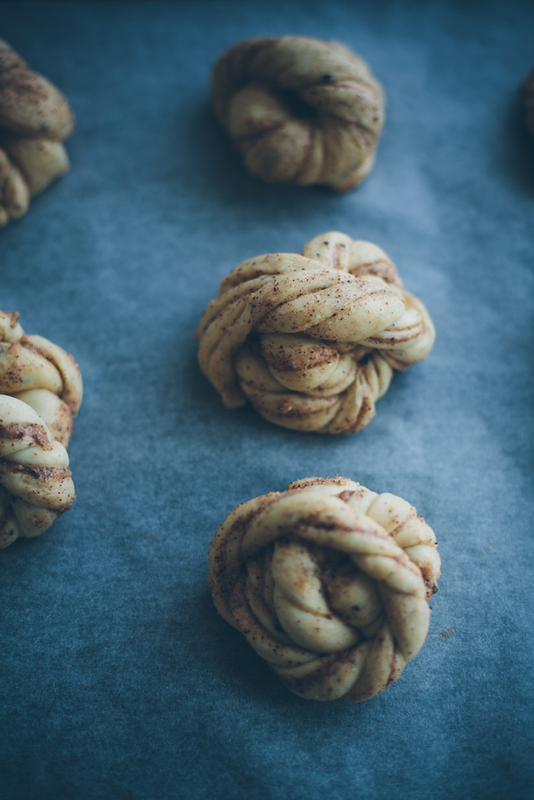 Making cinnamon “knots” is not my thing. Just sayin. I struggled quite a bit with making these look somewhat pretty but I think they ended up looking ok at least. They tasted amazing though, and that’s what counts, right? And I know that practice makes perfect. I need to make them more often. 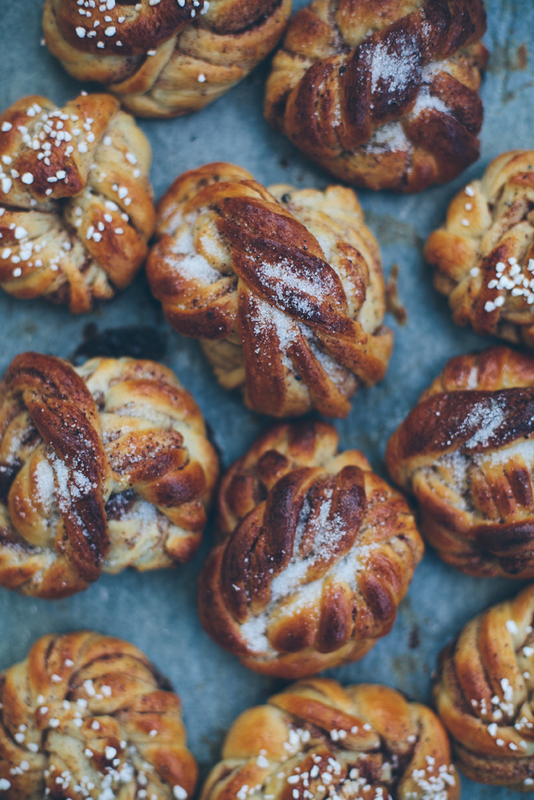 The last time I blogged about cinnamon buns was in November 2009 (!!!). Back then I wrote “I prefer mine without cardamom”. What?? I texted my brother the other day asking him if he likes cardamom. He said it was probably his favorite “spice”. I agreed. Things sure have changed around here since 2009. 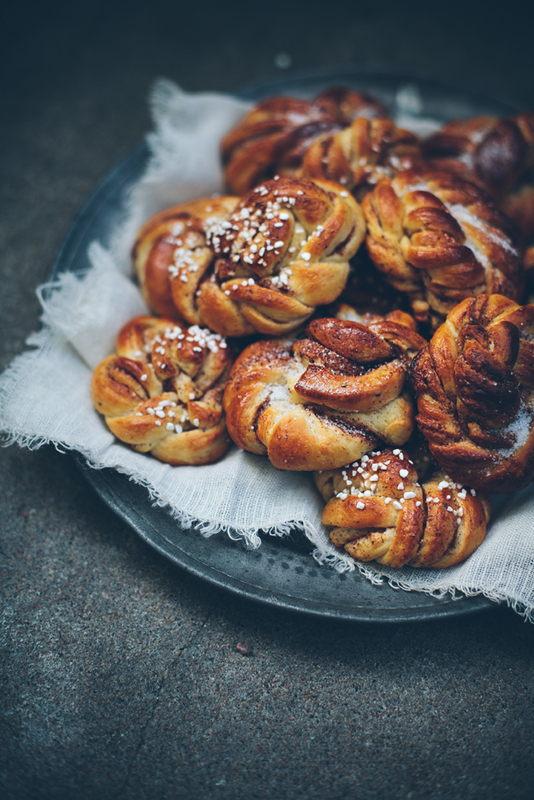 Tomorrow is the official “Kanelbullens dag” or cinnamon bun-day in Sweden. 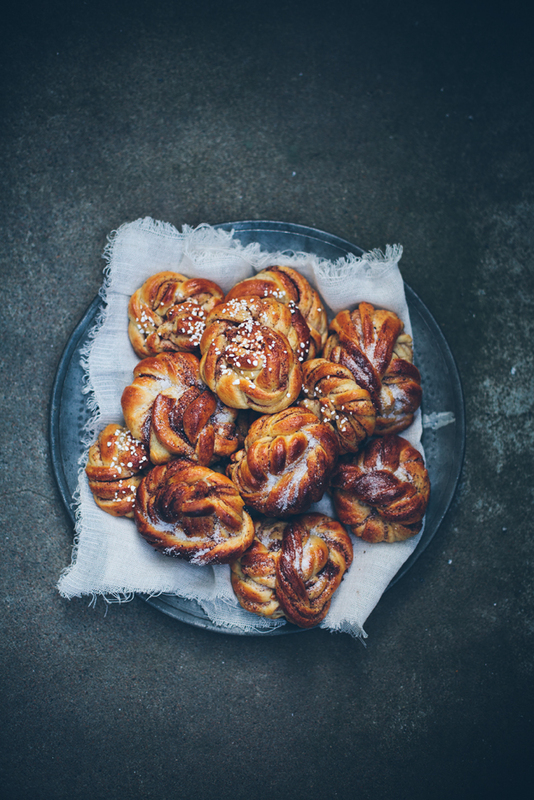 I must say that these buns are amongst my favorite things in the world, with a glass of milk or cup of coffee (make that coffee for me please!). I of course also make them with a little bit of extra filling. Mmmmm… butter. I need butter. Ok, just go make them! They are that good. On another note, the text on my blog is really picking a fight with me. Let me know if it looks weird on your screen. 1. Mix butter, sugar, salt and cardamom until smooth in a large bowl. completely dissolved, add milk to butter mixture. 4. Meanwhile, mix the ingredients for the filling and set aside. by rolling out the first piece of dough into a large rectangle, about 40×50 cm. Spread half of the filling on top. pictured here, fold the dough two times (so you have three layers of dough, kind of like a business letter!). 8. Twist together into a knot and put on parchment paper. 9. Repeat steps 5-8 with remaining piece of dough. 10. Cover with a cloth and leave to rise for 30 minutes. the size of the buns. So beautiful… and so good ! Can I used dry yeast and, if yes, how many grams? Thanks. Who are you a baking fairy? You are so magical, your photos, your food creations you are very special!! Wow! Oh yes, dry yeast? Must it be dairy milk or can I use coconut, almond or soy milk? Is vanilla powder like vanilla sugar? Thank you so much Aviva!! These are gorgeous! Love how it's all twisted! The text looks fine on my screen. And your photos are more then fine, they are amazing!! I can't believe I haven't tried cinnamon and cardamon together yet, I must do so soon! gorgeous photos and I love the braid on the buns! Alltså, dina bilder!! Du är grym! they look delicious! my mouth waters just by seeing them! I just felt in love with those buns. It's half past midnight and the only thing I can do now is stare at them. Such beautiful and modest photos! Beautiful! I wish Canada had cinnamon bun day! Lots of lovely pictures of the finished product but would have loved some pictures of the process of cutting and shaping. this looks so yummy!! i wish i knew how to make these… maybe someday? thanks for sharing! Thanks! 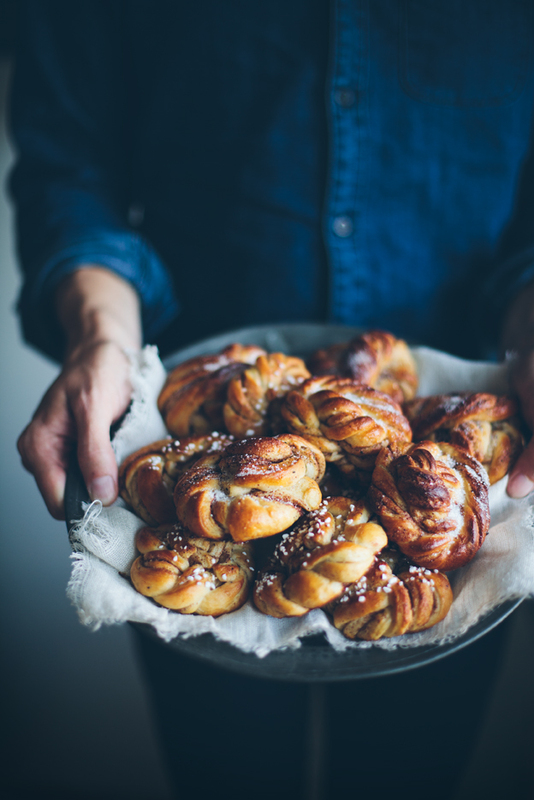 You can make them as regular cinnamon rools too, much easier! Underbart! Ha en fin fredag! Yes, they are perfect with coffee or milk 🙂 Hope you like them! Hi Linda ! 🙂 younhave the name of my dauther . I love to bake with yeast. Today i tryied your recipe ! the result looks great and it taste sooooo good ! Thank you for this great recipe !! Gosh, these photographs are so, so stunning!! Thank you Jade 🙂 Hope you had a nice time in Europe! Just made these and they tasted amazing! Thanks for the recipe. They look amazing! You've tempted me to have a go at these. Could I use sourdough starter instead of fresh yeast? Definitely!! I'm not sure how much though! Very nice impressions, thank you! They look amazing; certainly better then anything I could make! Definitely want to try out this recipe. I don’t have much experience when it comes to baking but I think the twist adds a nice effect to the buns. They would go great in the mornings with a nice cuppa. Your pictures are quite impression too. Thanks for sharing! They look amazing!! I sooo want to try them!!! Your photograph are gorgeous! Thank you Thank you for putting the measurement in grams! Beautiful photos as always. Also thanks for the youtube link. I'd be lost without it. You rock! Looks delicious!! I must try. 🙂 Let me know if you do! Varifrån har du fått den här bakrunden? 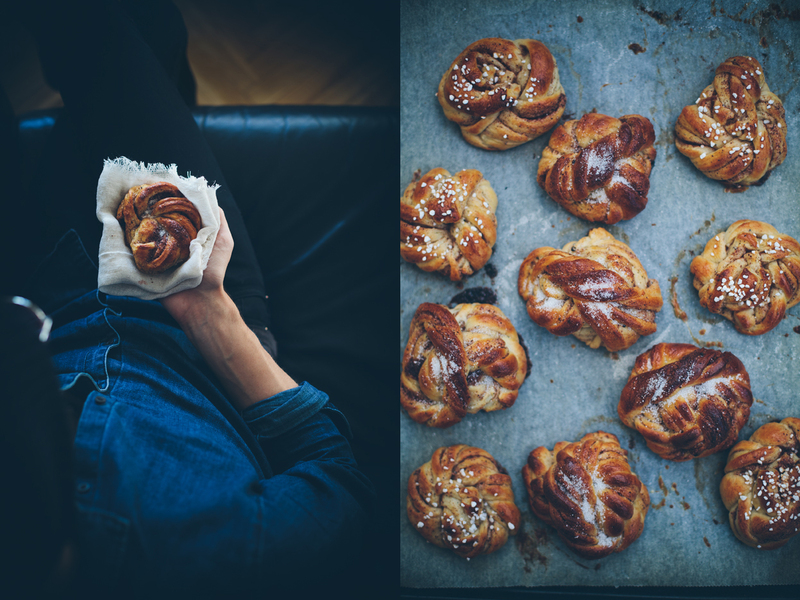 🙂 Din blogg och dina bakelser är så fina! Var har du gjort bloggens banner? Den är jätte fin!! Det är Tabitha Emma (http://tabithaemma.com/) som har gjort den också 🙂 Tack! Hej Agnes! Cream cheese frosting är inte alltid helt lätt! Det absolut viktigaste är att inte vispa cream cheesen för länge, helst inte mer än 30 sekunder. Ju mer man vispar den desto lösare blir den 🙂 Lycka till! Looks really good! I LOVE all your pictures, you're an amazing photographer! Not your thing? Ha! These look gorgeous! Such a beautiful layout! The photographs of the food are such a delight to look at. The lighting and the detail that is shown through the images are so life-like. Easy to follow instructions and an irresistible collection of perfect images are enough to convince me to try making these. Congratulations, you should be very proud of a website so perfect! Yum! Those were undeniably THE BEST cinnamon rolls I've ever, ever made or eaten. My friends loved them jsut as much 🙂 You're golden! Yaaay! So happy to hear this! Greetings from Lithuania! I‘ve just made those wonderful buns. They look amazing and taste absolutely gorgeous. The taste is balanced, sugar, yeast, butter… Everything is perfect! Thank you for your kind words! So glad you like them! I always thought so too! But they really are simple to make! I love this recipe Linda. I tried many recipes, but yours is perfect. is from late October that I continue to make cinnamon rolls and I fear that I have not finished yet, because my 3 year old daughter keeps asking every day. Hello Linda! Once the dough is done, can I leave it overnight and bake the buns the next morning? They look amazing!! Thank you! Hi Cecilia! You can leave the dough to rise in the fridge overnight (not in room temperature!). In the morning, shape the buns and leave them to rise (this will take a bit longer because of the cold dough), and then just bake them 🙂 I've heard this develops even more flavour. Best of luck! Dear Linda, I'm planning on bringing these for a brunch with friends. Can I prep the day before and bake them off in the morning? Is there anything I need to consider? Thank you very much, Linda! It's verylovely and inspiring blog! What should be the thickness of the dough? Thank you in advance! Greetings from Belarus! Thanks again for the wonderful recipes! I tried your recipe yesterday but unfortunately my dough didn’t rise well. I guess this is due to the fact that I wanted to make about 10 cinnamon buns and divided everything by 3. So, my question is: how much yeast should I put for 10 buns?